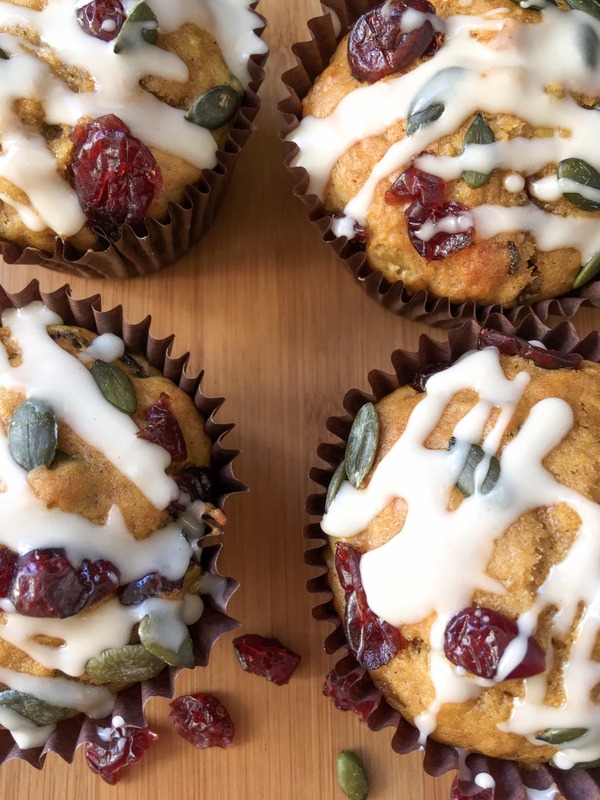 Soft and tender coffee-house style muffins full of pumpkin, cranberries, warming spices and topped with a maple syrup glaze, these pumpkin and cranberry maple glazed muffins are perfect for cosy, Autumnal baking days. Make them and you will be rewarded with the scent of pumpkin spice wafting through your home! Autumn is my absolute favourite season for many reasons. Everything just looks so pretty at this time of year. As much as I try, I’m really not a Summer person. I just can’t function all that well in very hot weather. I get irritable and cranky. I’m a much nicer person altogether when the weather is cooler. My favourite things about Autumn? Snuggling underneath fluffy blankets on rainy days, binge watching box sets. Pumpkin spice and gingerbread lattes. Halloween! I love Halloween – you wouldn’t find me putting out my lights and pretending I’m not home. I’m a big kid and get right into the spirit of it all. If I could get away with it, I would decorate the entire house. Not even kidding. But for me, the best part about Autumn is the FOOD. It’s all about serious comfort food, right? It’s getting chilly, so we need soups, stews, casseroles and lots of cake. 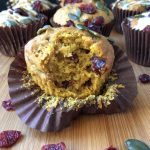 When the weather starts to turn cold and the evenings start getting dark much earlier, my mind definitely turns to cosy, comforting warming food like macaroni cheese, pumpkin spice lattes, gingerbread and pumpkin bakes just like these muffins. 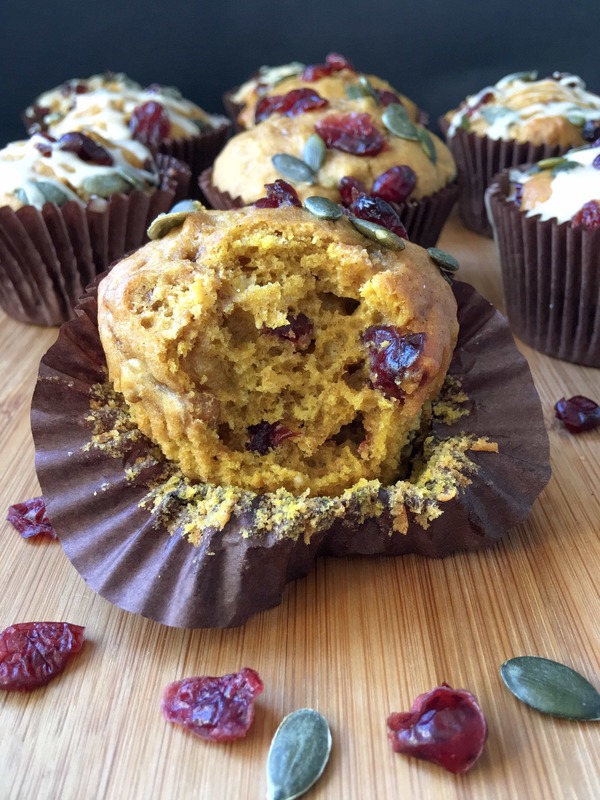 They are packed with all the flavours that are associated with Autumn – pumpkin puree, pumpkin seeds, ginger, cinnamon, nutmeg and maple syrup. They make a lovely snack any time of the day. Now I’m not claiming them to be a health food, but they do make a lovely breakfast and it almost feels like they are doing you good! Preheat oven to 200C. Line a 12 hole muffin tin with liners or spray with cake release spray. In a medium bowl, sift together the plain flour, bicarbonate of soda, baking powder, ginger, cinnamon and nutmeg. Melt the butter in a small saucepan. Once melted remove from the heat and beat in the eggs, brown sugar, pumpkin puree and vanilla extract. Fold in the dry ingredients very lightly until only just combined, taking care not to overmix. Don't worry if there are a few pockets of flour at this stage. Quickly fold in the buttermilk/yoghurt, cranberries, pecans or walnuts and pumpkin seeds, reserving a few seeds for sprinkling over the top. 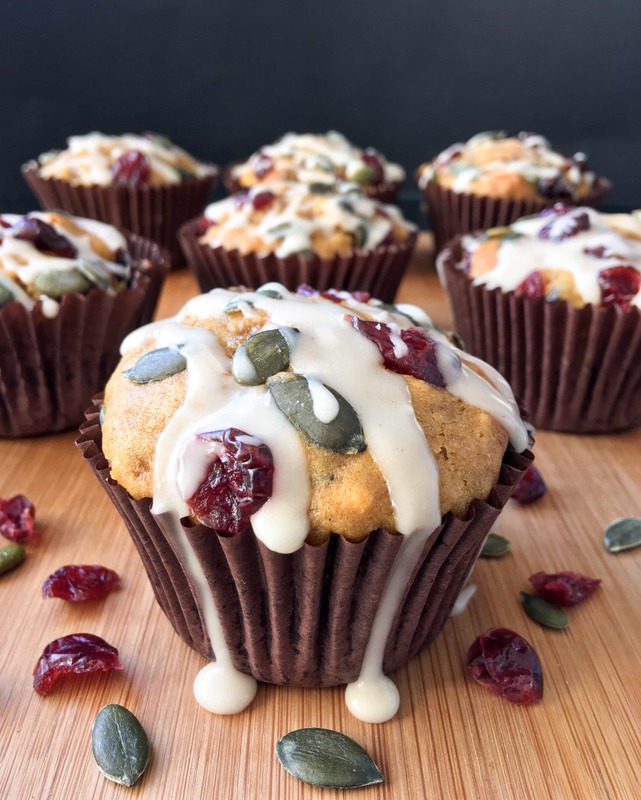 Spoon the mixture into the muffin tin and sprinkle the reserved pumpkin seeds over the top. Bake for 20-25 minutes until well risen and golden. Transfer to a wire rack and allow to cool. Mix the icing sugar and maple syrup together until you have a fairly runny icing but is still thick enough to coat the back of a spoon. If it seems a little too thick you can add a few drops of water. Messily drizzle over the waiting muffins or dip the tops of the muffins in the icing for a thicker coating. Allergic to nuts? No problem - just leave them out! Tinned pumpkin puree used to be very difficult to find in the UK, but it's now available in many of the larger supermarkets. I use the Libby brand. Those look and sound gorgeous. Totally up my street! Is the pumpkin puree the same as canned pumpkin or do you make it yourself?